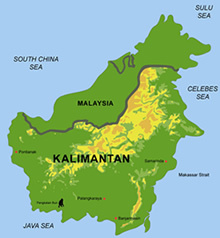 With a high-resolution Airborne Laser Scanner (ALS, LIDAR) the topography of Kecamatan Bukit Batu was scanned on 8th Aug. 2007 by a helicopter to achieve a 3-dimensional Digital Elevation Model (DEM) with an area of approx. 4km x 10km. With this ALS-information we processed and analysed the topography of Bukit Batu with an elevation resolution of +/-15cm and x-, y- of 0.5m. The 1.5µm laser beam in the near infra-red with the beam divergence of 0.5mrad could penetrate the forest by 3% to 5% of the laser-pulses. We processed 13 overlapping tracks each of approx. 500m width and combined them to a 1km x 1km grid with a 1m by 1m raster, so that we achieved 40 grids of Bukit Batu. These 40 grids are available in so-called Digital Surface Models (DSM) with trees, houses and bridges and as classified Digital Terrain Models (DTM) without trees, houses and bridges. Additionally we gathered in parallel to the ALS/LIDAR-data many RGB-photos with 4080 x 5440 pixels each covering an area of approx. 400m x 500m, so that we have a very high-resolution image of approx. 0.1m x 0.1m. The mosaiking of these RGB-photos to a merged Ortho-Photo is not easy. It needs correction in helicopter yaw, pitch and roll angle and also corrections of the Hasselblad camera with a 50mm optic and the different flight altitudes of the helicopter between each RGB-Photo. The 7 Bukit Batu hills were analysed carefully with and without trees and houses (DSM and DTM). So we created topographical maps with contour-lines in 1m and 5m EL-steps and we can measure the activities of quarry the granite body. The top of each hill has been measured. From these 40 DTM-grids (each 1km x 1km) we used 6 grids of Rungan Sari area to produce a topographical 3D-Model in a scale of 1:10,000 in x- and y- and 1:1,000 in z-coordinate (elevation). This is a 10 times enhancement of the z-coordinate and give a remarkable view of the area with several creeks and small hills. We found also a sand-pit with 8m depth. The 3D-printer of the high-school in Stuttgart can print a 3D-Model of 20cm x 25cm in many layers, so that we select an area of 2km x 2.5km with the mentioned scale of 1:10,000. The lowest point with 20m at village Sei Gohong with river Rungan shows a blue colour and has approx. 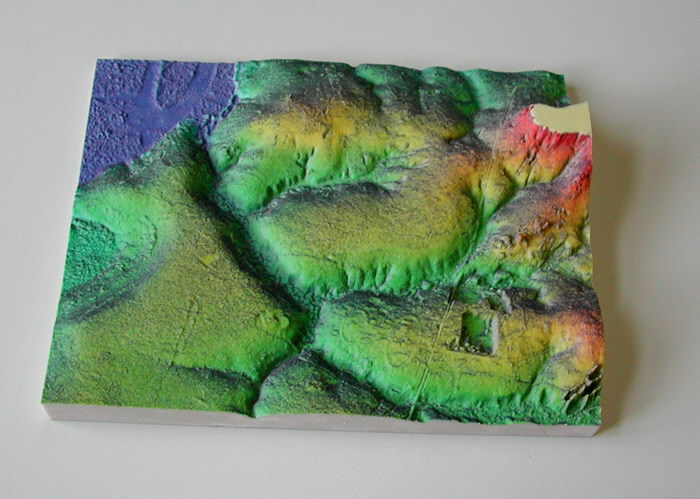 2cm thickness of the 3D-Model and the highest point of the Bukit Batu hills for this area was cut at 60m showing with red colour and has there a 6cm 3D-Model thickness, see image.